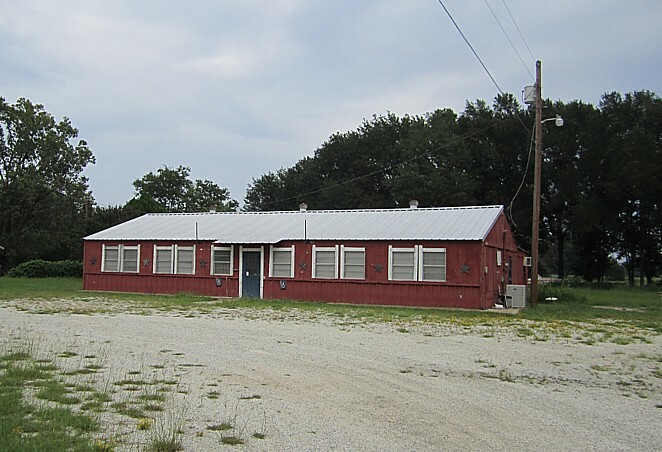 With my wife off on the road on business and no real blues doin's that I wanted to do this weekend, I told Scott I was heading down to Mexia and Groesbeck to check out some BBQ spots and pay my respects at Blind Lemon Jefferson's grave in Wortham. I told him he was welcome to come along or just read about it later and I quickly got back an e-mail saying "I'm IN!" I had a racquetball game at noon so we got a late start, 1:30 pm. 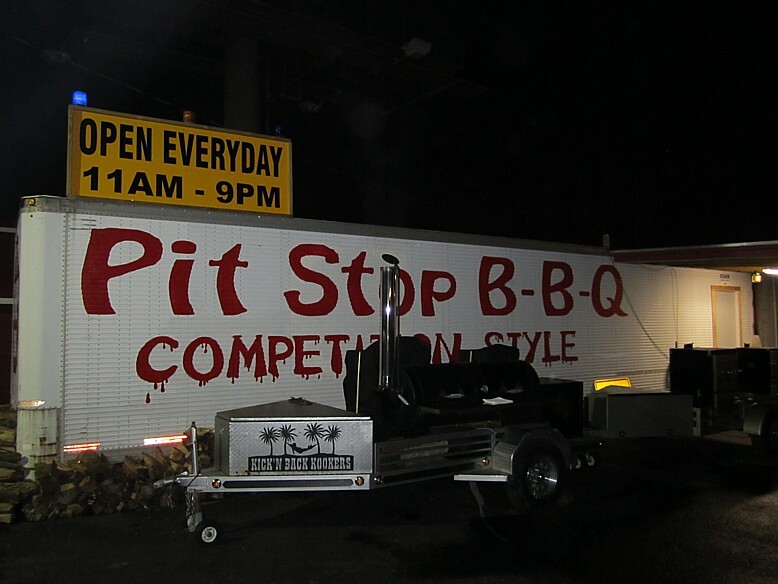 It was only about a 2 hour drive so I figured we had plenty of time for BBQ-ing on a Saturday. 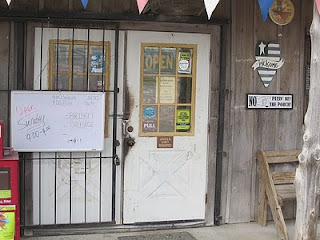 After a few adventures, we made it to Groesbeck, found 2 of the 3 places I wanted to try (Swick's and Kyle's Trading Post), but both were closed. Drat. 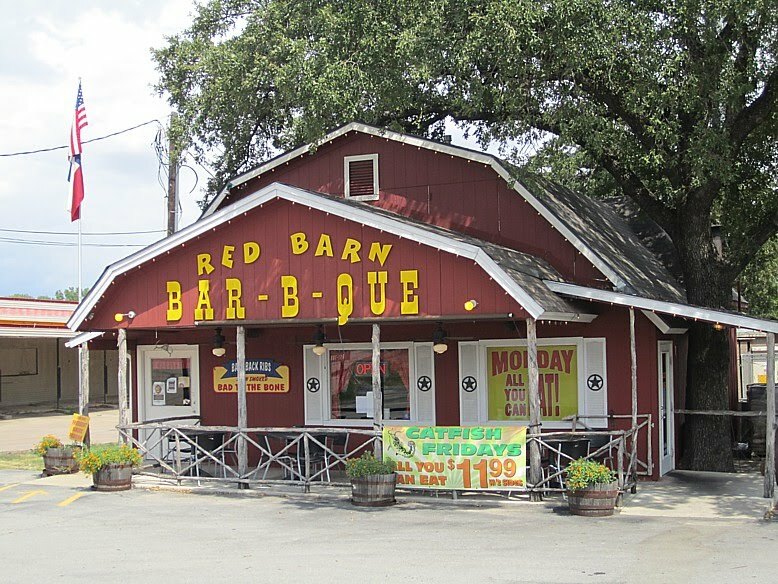 Back to Mexia, we ate at the one spot we had passed, then hunted for two more, one was closed (Kirby's BBQ), the other extinct (Queens BBQ). Double drat! After that, things got better and we ended up sampling 5 joints with one real find. Lots of reviews and photos below. We will be headed back out 287 in a few more weeks to chase some more joints we haven't tried yet. Remember, CLICK ON THE PHOTOS FOR A LARGER VIEW. After leaving Alma, we headed up 287 thinking we could reconnoiter a few more places as darkness fell. 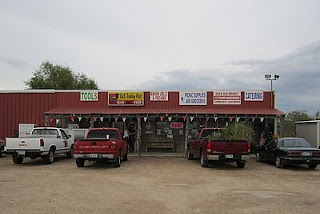 Unfortunately, we got stuck in a traffic jam as the Texas Motorplex race track crowd left from the day's races. Grrr. 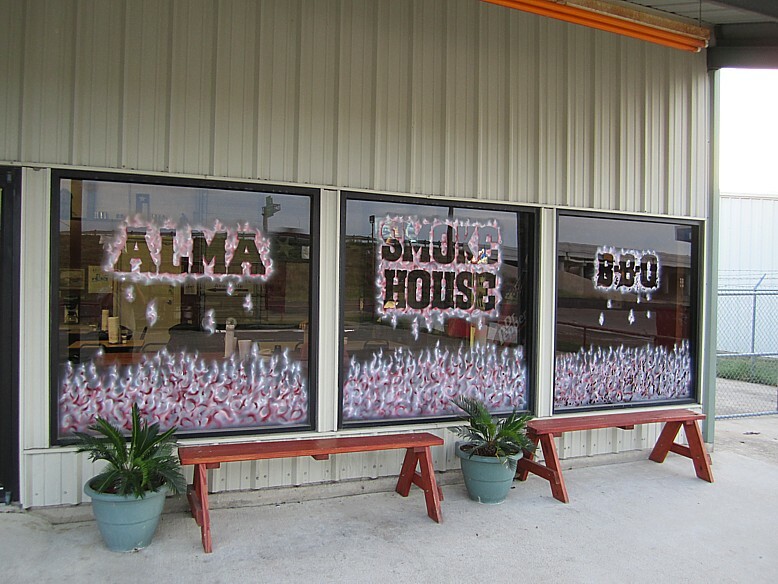 We figured that was the end of this BBQ adventure, until we stumbled onto this hopping little joint just down the road a piece. 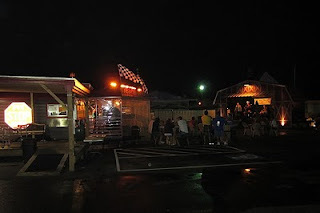 Open til 9 pm! Well alright! 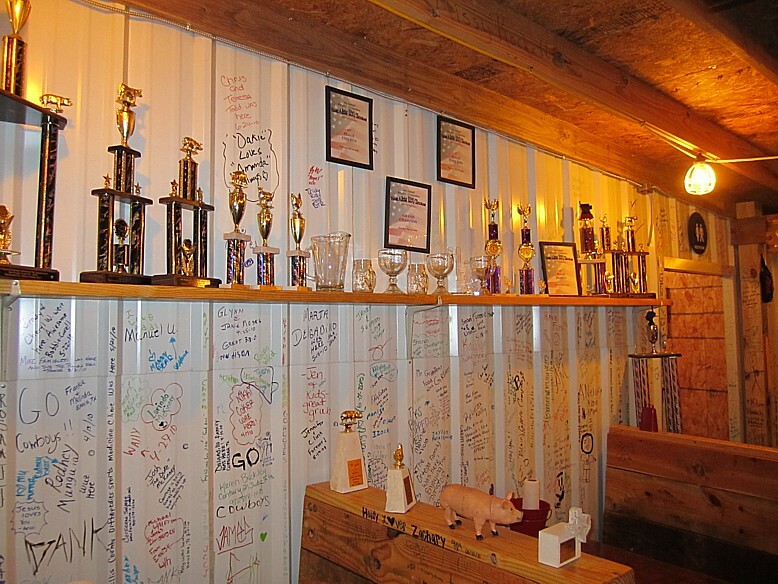 These guys are competitive BBQ cook-off folks and this is their home base. There are trophies everywhere, mostly IBCA. 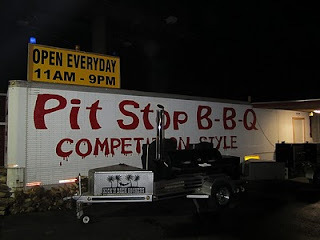 They offer "competition style BBQ", whatever that means. 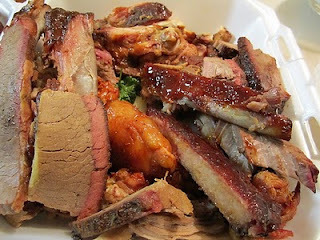 We wrangled up a 3 meat plate, which arrived so quickly I was shocked. We opted for their converted railroad car dining room (nicely air conditioned) and dug right in. Right off the bat we noticed a fruity taste in the mix we couldn't quite put our finger on. We were guessing apricot, but later learned it was a dash of apple juice. Definitely a different taste. 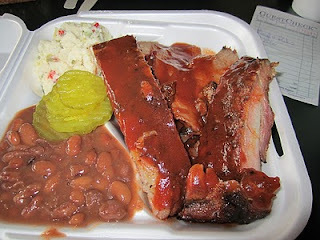 The ribs and brisket were very tender and moist, but neither had a lot of smoke flavor. The tater salad was good average chunky style but the beans were exceptional. Some of the best beans I have had outside of Llano. The beans really were tasty. 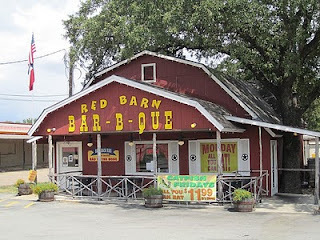 Their sauce was spicy and heavy on the molasses, but without the fruity taste we found on the meat. 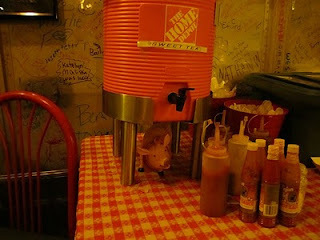 I should have tried some on the brisket, but we had already eaten up all the brisket before opening up the sauce cup. 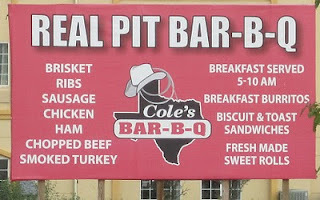 This was good stuff, I would definitely eat here again, but I think the apple juice just weirded us out. 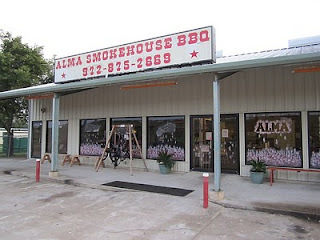 Plus they followed up Alma's amazing smoke flavor which would be a tough act for anyone to follow. 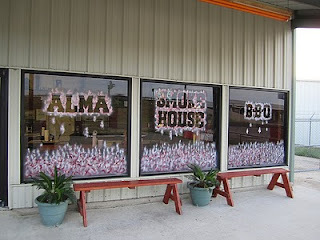 I think when we go back to Alma, we will stop here first and give them another shot. 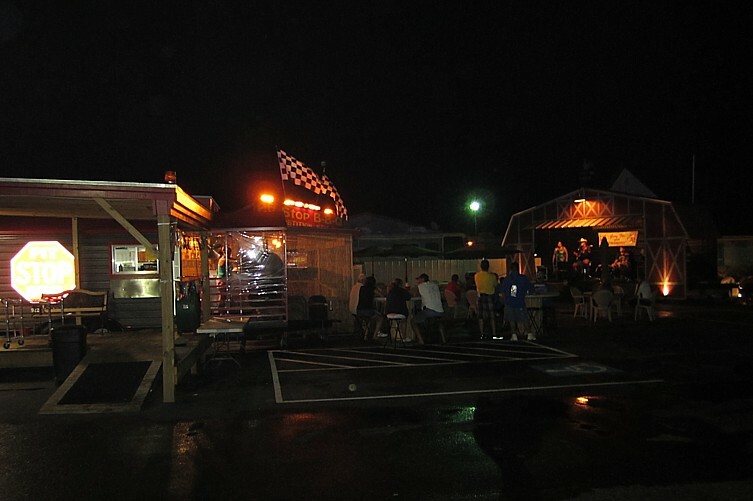 This was a hopping little place with a big crowd (probably from the race track down the road). They also had a small stage out back with a live country band playing. 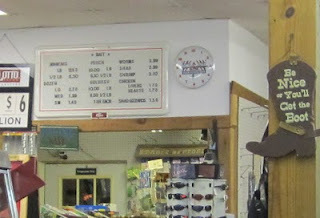 They encourage their customers to write on the walls and you could spend hours just browsing the wisdom and silliness there. I also loved the little touches like the little pig hanging out underneath the sweet tea! Alright, now THIS is why we do this. 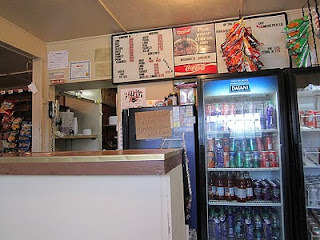 This was the best stop of the day and they were durned near out of food when we got there. After we had some, we understood why. 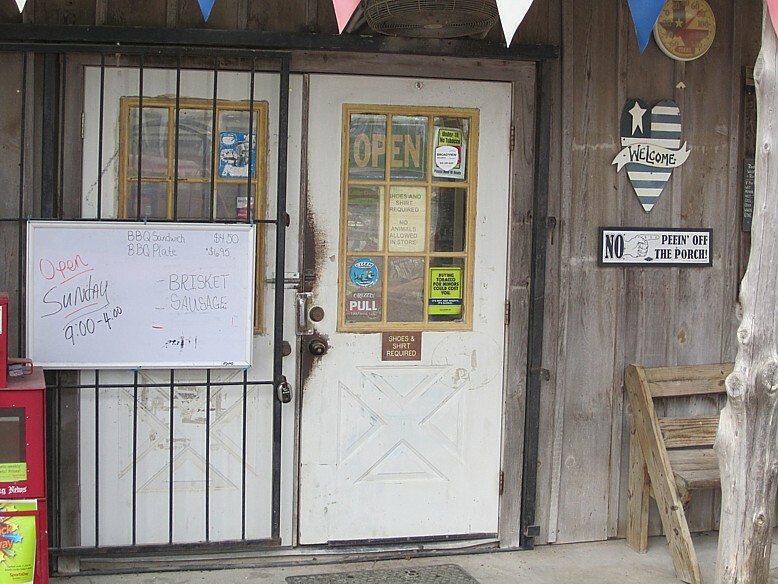 When we got to the counter, the lady told us they were out of just about everything except brisket, chicken and fried catfish. 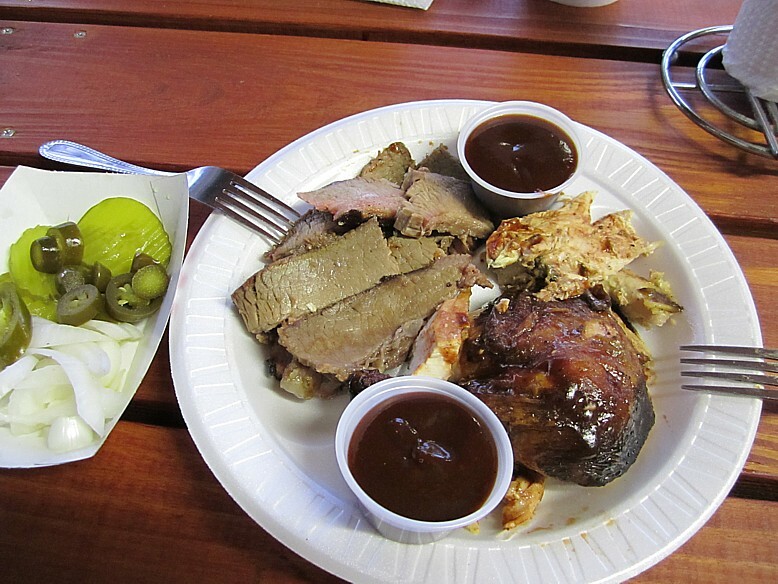 Ok then, we settled for brisket and chicken. Sides? 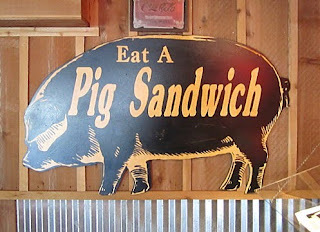 They were out of most of those, too, so we just opted for the meat with some bread and pickles. 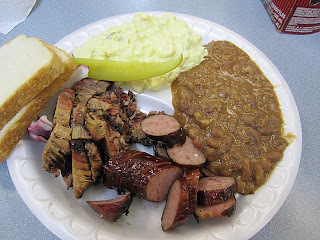 While we waited for our meal, I pointed out to Scott that I-45 was just outside making this "Highway BBQ". 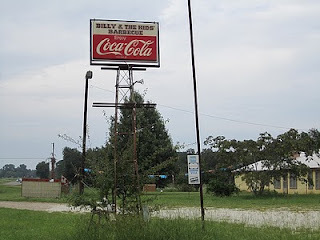 He said since they didn't have a highway billboard the jury was still out. 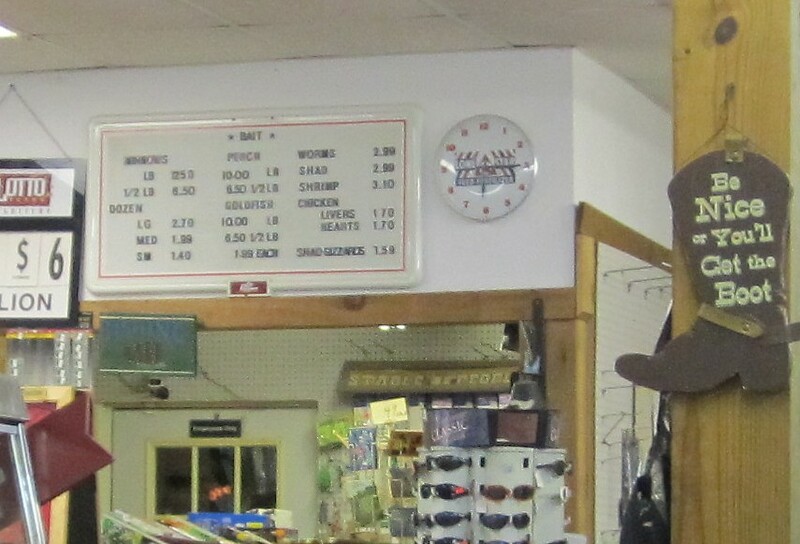 We also noticed two pictures of John Wayne on the wall. In previous BBQ soirees, we have noticed a definite coincidence of John Wayne appearances with the arrival of better than average BBQ. The John Wayne theory continues to work! When our meat arrived the brisket looked unremarkable, but the chicken was beautiful and appeared to be competition quality. We got a quarter plus several separate pieces of chicken and they were moist, tender and chock full of smoke flavor. Scott pronounced it the best chicken he has ever had at any BBQ joint. I have to concur that it was durned good and almost as good as my wife's smoked chicken. However this was much prettier than hers! Sorry dear. The brisket was very tender, a slice pulled apart easily, but was just a tad dry. It's hard to whine much about that for a 7 pm meal, but the smoke flavor was simply awesome. 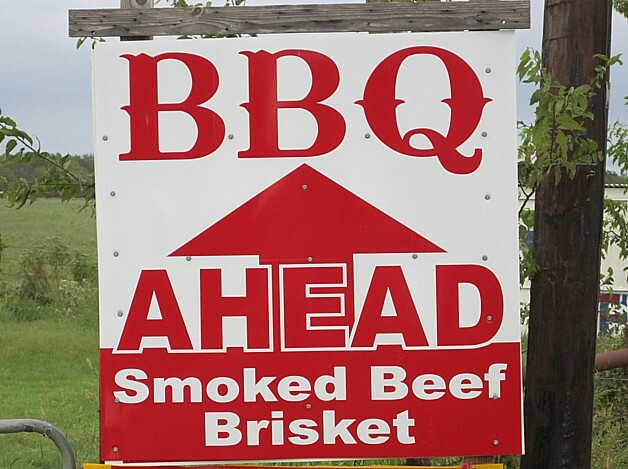 By far the best brisket we had all day long. More proof that smoke rings and pretty bark isn't all there is to great Q. They're always a good sign, but if they aren't there you'd better shut up and taste it anyway. 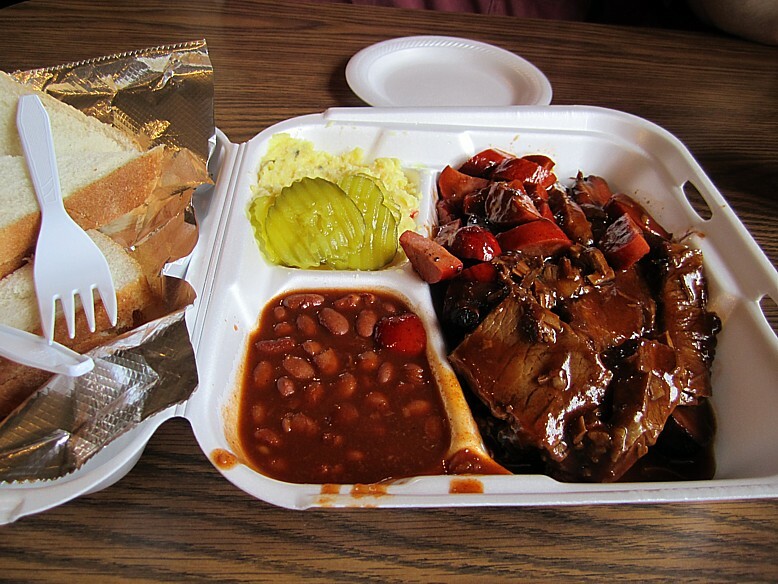 If you look at the pictures of that brisket, it tells you nothing of the amazing smoke flavor it had. I was still tasting it 30 minutes later, and was happy about it! We will definitely be making a return visit here, soon, and NOT at 7 pm. We want to sample the rest of what this joint has to offer and see if they have this level of "the goods" on a second trip. You know you're at a classy joint when the first sign you see approaching the front door is one saying "no peeing off the porch!" 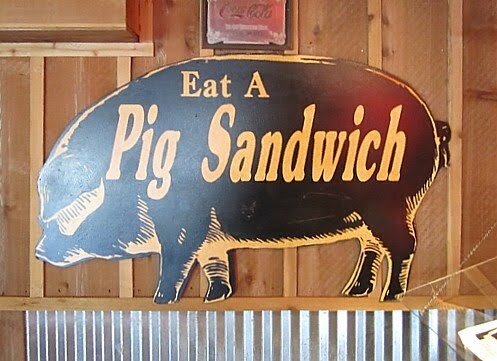 Yup, my kinda place. 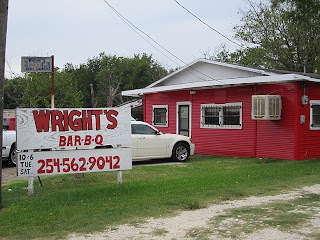 Inside we learned ribs were a Wednesday thing so we settled for a 2 meat plate with brisket and sausage. Their little dining room had lots of neat old oil boom photos from the 20's. 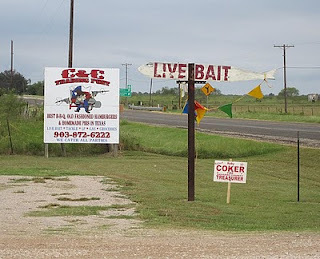 Being your typical all-around country joint, they also had live bait. I wonder if they've ever heard of the rare brisket bass? After a short wait our food arrived and it sure was nice to see some meat with nary a splash of sauce about! We finally remembered! 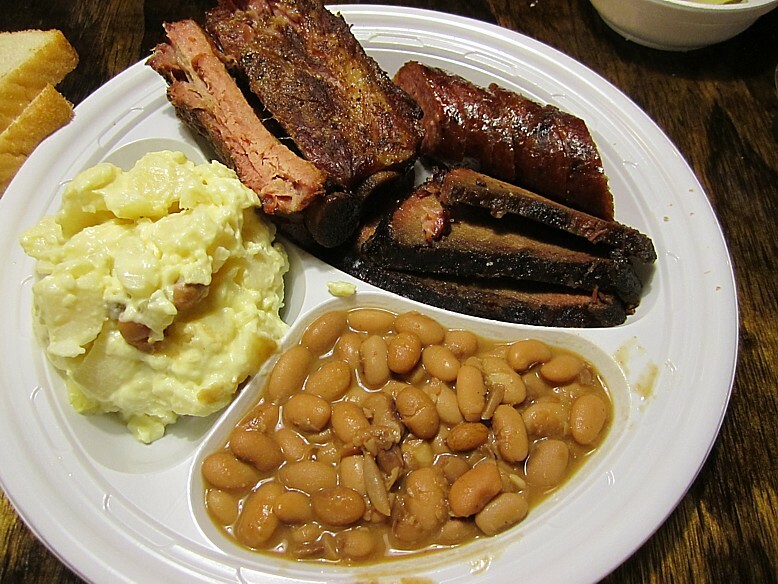 As you can see from the photo below, there was a LOT of bark on the brisket and it had some nice smoke flavor. The sausage was straight Ekrich but it had been well smoked, too. The pinto beans had cooked too long and were almost refried style beans. The tater salad was watery and is to be avoided. We sampled the table sauce and it was a bit spicy with a honey and mustard base. Not to my liking but Luling fans might dig it. 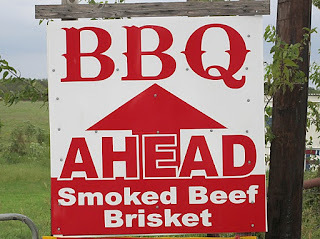 Overall the brisket was the rave up here and I sure wish it had been Wednesday. I'd like to taste their ribs. 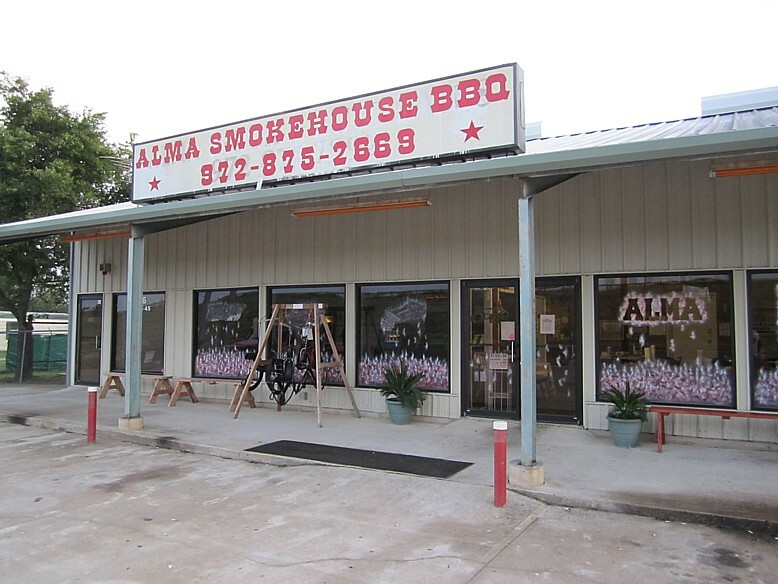 If they're anywhere near as good as the brisket, this would be a pretty good meat stop. 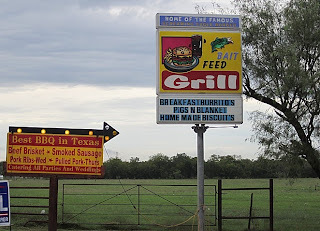 When we struck out on all but one joint in Groesback and Mexia, we decided to make a sidetrip over to Fairfield to hit a joint we had seen a sign for on I-45. Now normally, we don't go looking for BBQ inside gas stations, but seeing the stacks of wood outside and remembering our nice meal at Casstevens Diamond Shamrock in Lillian, we decided to take the plunge. Doh! Once again, being dummies, we forgot to ask for sauce on the side and got a plate full of soaked meat. The brisket was tough and bordered on inedible. 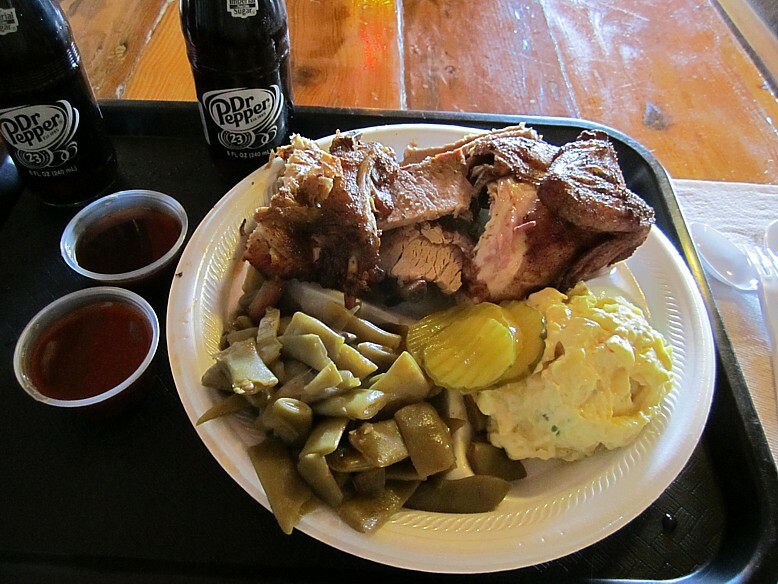 The rib I had was very tender and moist, but all I could taste was the sauce, which was not what I wanted to taste. Scott had less sauce on his rib and reported it had little flavor. Sides were very average. 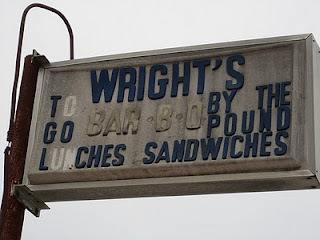 Scott claimed this was further proof of his adage against freeway BBQ and we quickly moved off in search of better things. After several strike-outs on finding open Q joints in Groesbeck, we stumbled back to Mexia and we were HUNGRY! 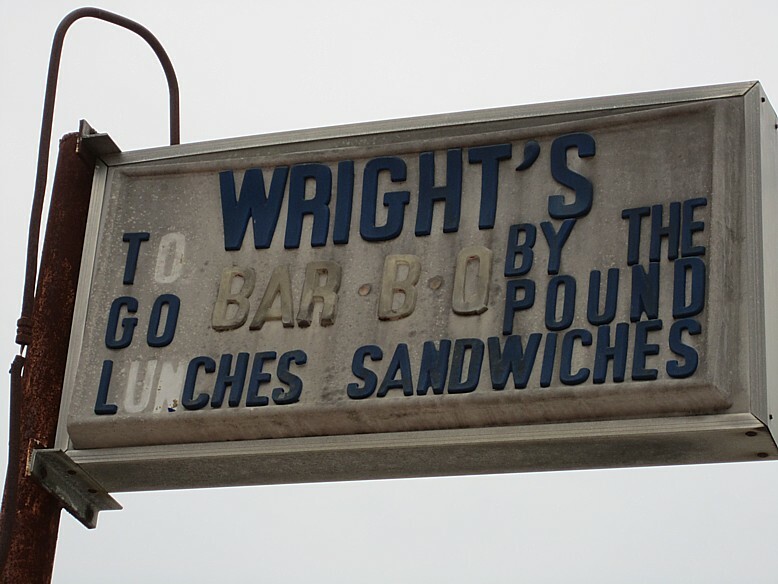 We had passed by Wright's on the way down south and happily noticed that they were open til 6 pm. Inside we ordered up a 3 meat combo and we didn't have to wait long til the nice lady brought us our plate. Damn! We forgot to ask for sauce on the side and the meat was swimming in it. Oh well, we were so hungry at this point we didn't really care. The rib I had kicked some nice smoke flavor, even through the sauce, but was a bit on the chewy side. The sauce was a rich tomato sauce and honestly didn't add much except to mask the flavor of the meat. 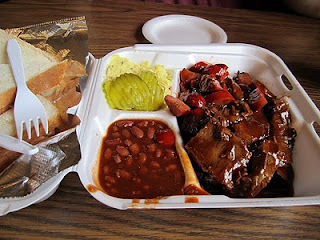 The brisket was very tender and also had a nice smoke kick that fought its way through the drenching of sauce. The sausage was average fine grind and nothing to get excited about. The beans tasted a lot like Ranch Style, straight from the can. The tater salad was a very nice creamy style and was well above average. I have a feeling that undrenched, that meat was way above average, but it will take a return visit to prove it. We shall definitely pull a MacArthur, here. We are off to Blind Lemon Jefferson country this Saturday to hunt for and sample Q between DFW and Mexia and Groesbeck. 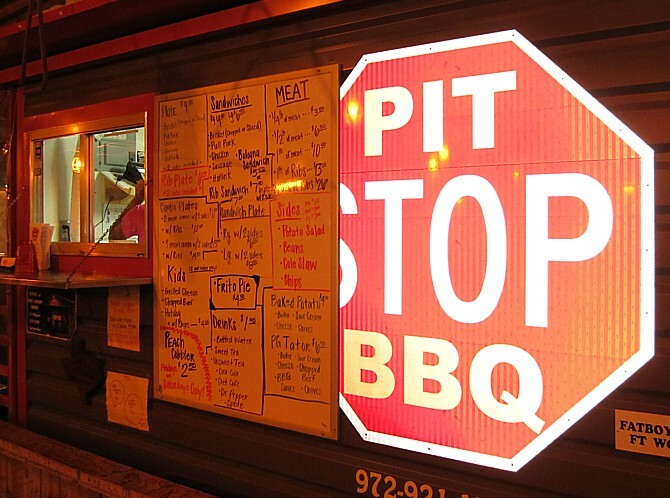 On checking the route more closely, google maps lists 19 BBQ joints along the trail. Knowing the accuracy of Google maps, I doubt we'll eat at that many places, but we sure will try! Reviews and pix - eventually. 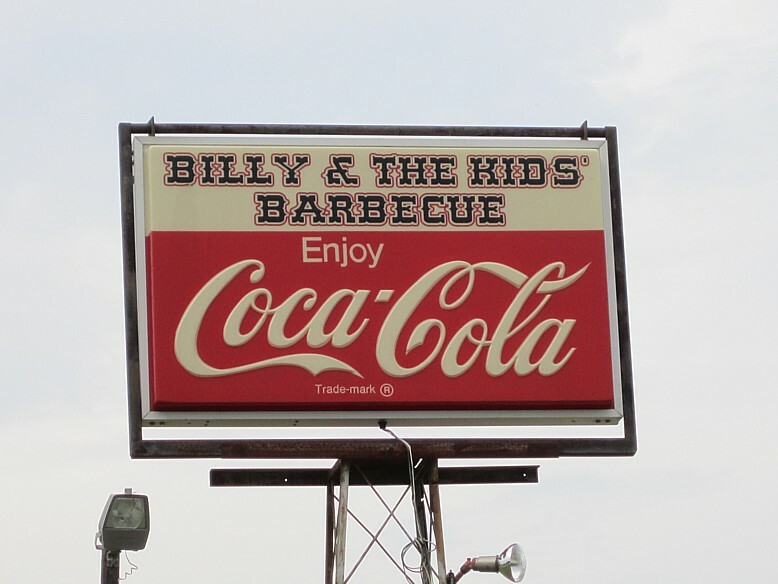 I just completed my first experience as a KCBS BBQ judge and I had a blast. This was for the Bedford Blues and BBQ Festival in nearby Bedford, Texas, the same folks who sponsored the judging class I took yesterday. The first step was seating, where they mixed up experienced and new judges, separated husbands, wives, and friends, and basically tried to give each table of 6 judges a similar mix of people. Once that was accomplished, we went through an orientation and learned there was also a sauce category to be judged today. We went through orientation, listened to the judging CD and took the judges oath, then sat down for sauce. Our table had 4 sauces to choose from and only one got high ratings from me. It was thick and spicy and I would love to have more of it. One, I swear, tasted just like spaghetti sauce! One of the other judges on my table liked that one the best. The ribs were up next and I was amazed at the quality there. The first box that came out I gave a perfect 9 on appearance. All the rest got 8's or 9's, too. Every single rib was above average on taste and tenderness, with only one getting a slightly lower score due to the thickness of their fruity sauce. All in all a fine bunch of ribs. 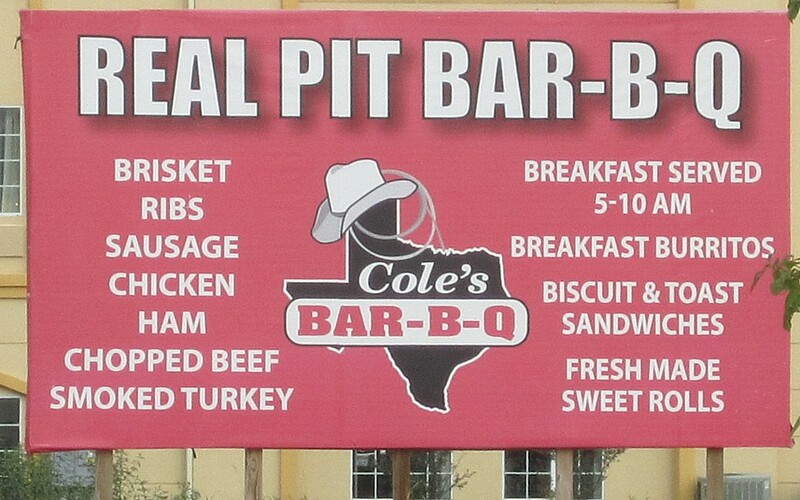 The pulled pork was not as good. Most lacked smoke flavor and there was not much bark in most of the boxes. Some were sauced, but that wasn't always a good thing. Several included medallions, some were chopped, some were pulled. It didn't matter much, overall this was the weakest category in this cook off. 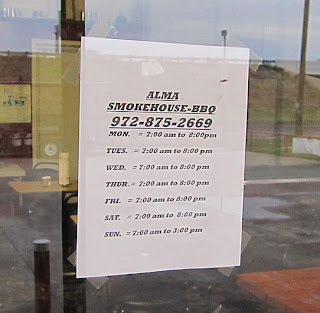 Brisket was the last entry we sampled but I have to say I was a bit disappointed. Every entry (except one) included burnt ends to go along with their slices. Only one of the 6 had real smoke flavor and it was off a bit on tenderness. Overall, it mostly tasted like DFW brisket usually does, like moist tender roast beef, not smoked meat. One competitor submitted chopped sauced brisket and it was just not very good. 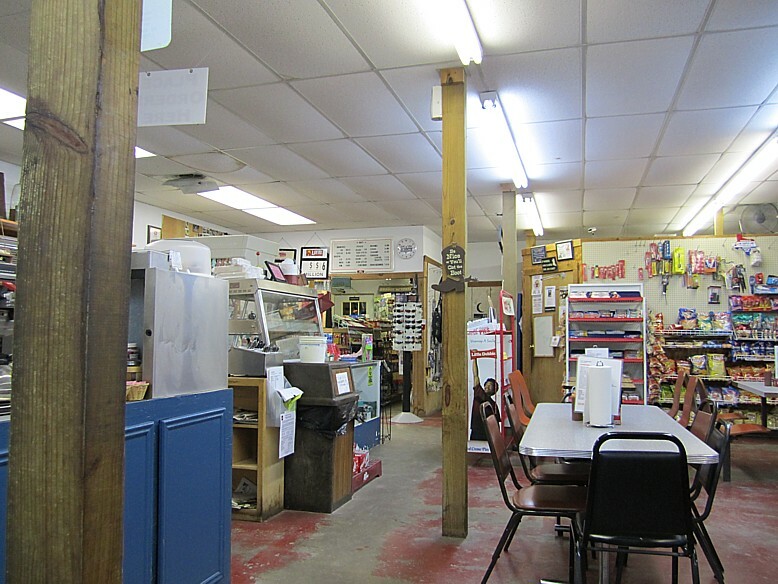 I have to say, it sure is nice to sit in one place and have them bring you sample after sample of smoked meat. You don't get the travel experience of running around from place to place, but you do get to eat a lot of good food. However, since it is blind judging, you can never go back for more!!! One of the "perks" of being a judge is you get to take leftovers home. 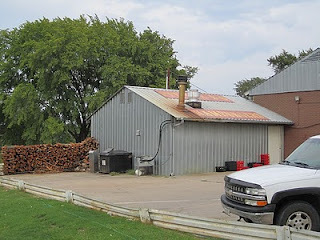 I left with several pounds of nice smoked meat which I will be enjoying for the next couple of days. I hope to do this again, soon!! I'm a KCBS BBQ judge! WoooHoo! I just finished the KCBS BBQ judging class held in conjunction with the Bedford Blues and BBQ festival. 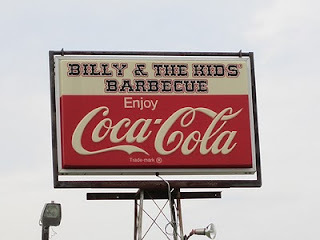 It was a lot of fun and I even got to eat some BBQ. There were about 30 folks in the class and most of the time was spent explaining the KCBS rules and methods of judging. 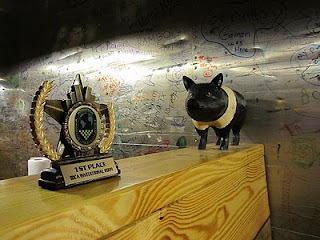 It all seemed common sense stuff and I look forward to putting it into practice tomorrow as a BBQ judge at the fest. I think I'm on the judges list. I'm getting the e-mails, but I have never gotten anything officially saying "your application as judge has been accepted". I guess I'll just show up tomorrow and see what happens. The worst they can do is send me home and I can go to North Main for lunch. 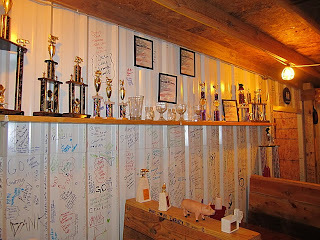 The class was an interesting mix of BBQ competitors, wanna-be competitors, and folks who just like to eat BBQ (like me). As they brought us various boxes to sample, some had rules infractions that we were supposed to notice (like sauce pools, red tip lettuce, and other no-nos). We graded each box, 6 judges to a table, and the scores varied pretty widely. 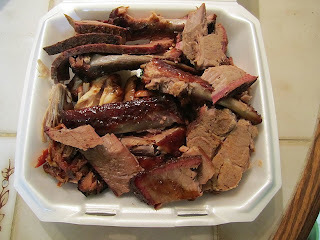 Once we got the ribs, I figured out all the food had come from the same source, they were just putting it in 3 different boxes and arranging it differently. The ribs were very good. Everything else was sub-par. 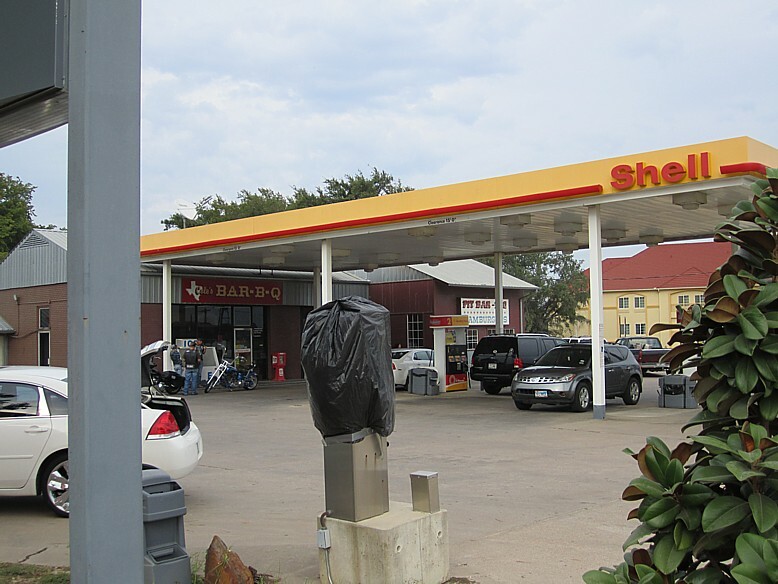 This is another one of those places I have driven by many times, but never had an occasion to stop. Well, I can cross it off my list. The brisket was moist and tender but zero smoke flavor. It definitely needed sauce. The ribs were tender but a bit dry with no smoke flavor or discernible bark. In fact, if I hadn't had a bone in my hand I would swear it tasted like pork tenderloin cooked in a crockpot. Wait, even with a bone in my hand, that's what it tasted like! I knew better than to order my usual sausage so I opted for the smoked chicken as my third meat. False advertising! There was no smoke flavor to be found and no discernible flavor from the rub. It was very moist and tender chicken, it just tasted like it had been baked low and slow, not smoked. The green beans were flavorless and the tater salad was average. They had a sweet and a mild sauce to choose from and I sampled both. The sweet sauce seemed to have a lot of honey in it and the spicy sauce had a good kick, but had too much vinegar to my taste. 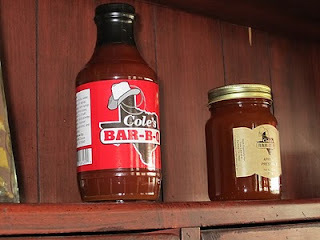 I ended up combining the two into a pretty decent sauce and it went well with my roast beef brisket.